Today’s news is buzzing with reports of Moscow becoming the most expensive city in the world. 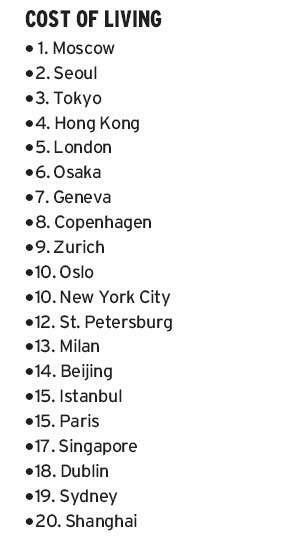 According to a survey by Mercer Human Resource Consulting, Moscow has topped Tokyo as the world’s costliest city. Many news reports have noted the obvious irony that the former capital of Communism is now the capital of capitalist expenditure. Few articles give much analysis as to why Moscow has surged so quickly and to such heights except for London’s Independent. In an article in today’s addition, it seems that Moscow’s rise has not come without cost. Prices for flats have more than doubled in the past year and the average cost per square metre is about ?2,700 and rising by the day. A modest city centre flat is now hard to find for less than ?190,000, a big price when you consider that the average national wage is ?170 per month and the average monthly Moscow wage about ?350. Cranes labour over Moscow’s skyline day and night and immigrant workers from across the former Soviet Union toil on building sites for poverty-line wages as developers try to snap up more and more land to cash in on the boom. There are not nearly enough good quality flats to go around and prices seem set to rise even higher. Indeed buying a flat in the Russian metropolis is now just a dream for many young Muscovites, who can only rent rooms in rundown flats in the city’s concrete suburbs in Soviet-era tower blocks. People desperate to get a foot on the property ladder resort to desperate measures; the media often carries stories of contract killers hired to bump off flat owners, of elderly people tricked out of their city centre apartments, and of apartment blocks burnt down “accidentally” to force people to sell. Renting in the centre of Moscow is also too expensive for many. Western companies regularly shell out more than ?5,000 per month in rental costs for their employees and it is hard to find anything decent for less than ?1,000 per month. Hotel prices in Moscow are also higher than anywhere else in the world. The average room rate is ?165 per night, thanks to the city’s bizarre strategy of knocking down large cheaper Soviet-era hotels and replacing them with exorbitantly priced, Western-style four- and five-star hotels, while making no provision for anyone on a more modest budget. Visitors to Moscow are therefore forced to choose between slumming it in a hostel or living it up at the Metropol. The Mercer’s report should be taken with a slight pinch of salt, however. It was primarily drawn up to help multinational companies decide how much to pay their expatriate employees posted abroad. The final note is an interesting tidbit. As news agencies quickly churn out the news about Moscow ascendant, they forget to ask the vital question in regard to any such statistics: Expensive for whom and for what? Now for expat employees, I’m sure glitzy clubs and Moscow whores can drive up one’s cost of living rather quickly. All of this begs the question as to what this news actually tells us about life in Moscow. In all, very little. However, there is one truism: Moscow is expensive. Muscovite natives, though, know how to cut corners and navigate the city’s costs with exactitude. Very few of average Russians are paying exorbitant rents, and they are certainly not staying in four- and five star hotels. This is in no way to suggest that Muscovites aren’t effected by the city’s rise of expensive prominence. As the Independent article points out, public transportation costs and food prices have risen substantially in the last decade. Moreover the scramble to wrestle expensive property from the hands of pensioners has resulted in scams, terror and violence. The rise of Moscow in post-Communist Russia has had other results. You can’t look across the skyline without having your view obstructed by a construction crane. Construction requires labor. Lots of it. And the cheaper the better. Moscow’s boom has a magnetic pull on populations, flooding it with immigrant labor. The recent rise in racial tensions in the city cannot be separated from the centripetal forces of urban expansion and financial dominance. While some wish to paint Russia’s current race problems as simply manifestations of a deep seated racism within the Russian psyche, the current socio-economic conditions of the capital serve as a better explanation. This is not to say that racism in Russia is absent of cultural roots. It is to say that they rise to the top under particular conditions. Hence the slogan “Russia for Russians” and other xenophobic rhetoric becomes quite salient in many minds. Moscow may be on top but that doesn’t mean is has come without cost. If anything the capital’s boom places it well within processes that every metropolitan on the planet is experiencing .